The leg is divided into four compartments that are divided by bony and fascial elements. 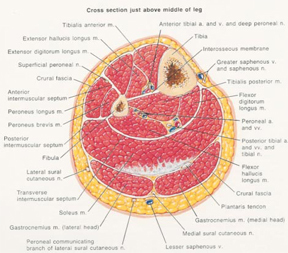 Some authors believe that the encasement of the tibialis posterior muscle may be considered a fifth compartment. Any of these compartments can develop a compartment syndrome from elevated intercompartmental pressure. With exercise, muscular volume can increase up to 20%. In compartment syndrome, the dividing fascial layers cannot accommodate the additional volume resulting in the collapse of venous return and neuro-compression (in advanced cases). This leads to the onset of ischemia and soft tissue damage. As more soft tissue injury occurs, there is further pressure elevation within the compartment, and this viscious cycle propagates. Acute compartment syndrome is a medical emergency that occurs when compartmental pressures exceed 70 mmHg. Immediate referral is necessary in these cases for surgical release of intercompartmental compression. Complications from lack of care in these cases may yield permanent neurologic and/or muscular necrosis, or rhabdomyolysis (the rapid breakdown of skeletal muscle dure to injury) with acute renal failure. Although there are many signs of diminished perfusion, decreased pulses and capillary refill is a late finding with significant intracompartmental damage occurring prior to this. More common, and more clinically challenging is the presence of chronic compartment syndrome, or Chronic Exertional Compartment Syndrome (CECS). This condition typically affects younger individuals (13-30 years of age) who are engaged in endurance sports or intensive training regimens. Another cause as is suggested with the patient above is repetitive trauma to a muscle group/compartment. Patient usually denies edema, temperature, or colour changes. **Capillary pressure in skeletal muscle is between 20-30 mmHg; thus pressures exceeding this will compromise oxygen delivery and CO2 removal. For the patient we are discussing, I would expect that his physical findings would be minimal. Most likely one would palpate an increased ‘tonus’ in the affected area, which increases with exercise. The presence of objective neurological or vascular findings would most likely not be present as was noted by the practitioner. Based on his symptoms, I believe the referral for diagnostic testing is appropriate. This is actually a common occurrence that I have found with treating MMA athletes due to either overtraining, and/or chronic repetitive trauma stemming from pad or heavy bag work. Just an additional inquiry. If the slit catheter results come back positive for CECS, should the patient be lead towards surgical release as in Acute Compartment Syndrome? The answer will depend on the seriousness of the symptoms as well as the athletes goals. I am one to always opt for a trial of conservative management first which should begin with training modification including altering the frequency and intensity. Deep water training is often a good alternative to allow the athlete to keep up conditioning. Biomechanics, training surfaces, and footwear should also be assessed. Treatment can/should include fascial release and joint manipulation/mobilization as indicated. With my experience, the most important factor regarding management is reducing training volume….then re-introducing increases in volume SLOWLY. It seems (as is found when rehabilitating almost all conditions) that a slow and gradual implementation of progressing tissue insults (ie. increasing volume) induces changes that allow the body to adapt to the loads.